Although Gemini is our home base, we will have to become land-lubbers once in a while. 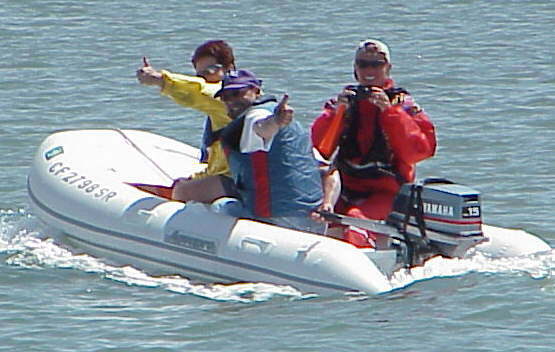 So we have "commuter" boats called dinghies which we lower into the water and take onto shore. The Aquapro gives us lots of great options on the water. Our friends say "Bon Voyage" in style . . . and we catch a 26-lb halibut! This aluminum-bottom inflatable will plane easily, and has taken us to many a fishing spot just in time to catch dinner. What attracted us originally was the 100 pound weight--a real break-through for hard-bottom inflatiables. With a 10-year warranty on the fabric, heavy duty rub strakes, over-sized tubes and a very competitive price, the choice was fairly easy for us. The locals in Capitola, watching us from their windows, said they were calling us "The White Bullet"--great fun! Outboard Motor A real power trip, this outboard will drive our Aquapro with ease. Weighing almost 70 pounds, it requires a lift for wimps like Diane. We purchased the Nova Lift which mounts on our stern railing and, with a 5-to-1 purchase, makes it easy to lower & raise the dinghy. Outboard Motor Our previous outboard was sacrificed to Neptune, so we bought this one at West Marine's clearance center in Alameda. A nice alternative to the Yamaha, this 30-pound motor is easy to man-handle and OK for short hops. www.GivensLiferafts This decision is the least exciting, because it is a piece of equipment you hope you never have to use. But, as Les put it, if we do ever need it, we will be having "a very bad day", so we don't want to be disappointed. The balast design and the video demonstrating their stability in rough seas made the Givens a clear choice for us. With the automatic release feature, it is a bit of insurance we're glad to have. Fishing Gear We have 4 poles and 2 handlines, and are excited about catching just about anything, although we release most of them. 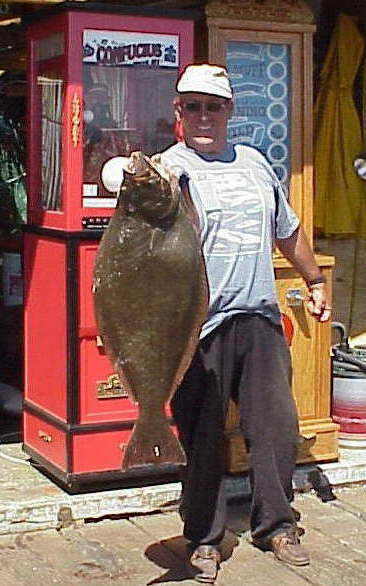 During our first week, Les reeled in a 26-pound Halibut, so the pressure is on! Fishing is always a good motivator for launching the dinghy and exploring new areas. The Lunker Bas A hand-held electronic toy, this game keeps our skills sharp for the real thing. Choosing worms, jigs, spinners, cranks or topwaters is about the most stressful thing we've done so far.